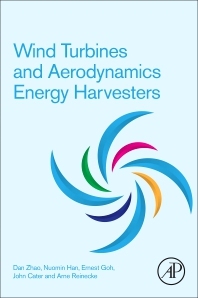 Wind Turbines and Aerodynamics Energy Harvesters not only presents the most research-focused resource on aerodynamic energy harvesters, but also provides a detailed review on aeroacoustics characteristics. The book considers all developing aspects of 3D printed miniature and large-size Savonious wind harvesters, while also introducing and discussing bladeless and aeroelastic harvesters. Following with a review of Off-shore wind turbine aerodynamics modeling and measurements, the book continues the discussion by comparing the numerical codes for floating offshore wind turbines. Each chapter contains a detailed analysis and numerical and experimental case studies that consider recent research design, developments, and their application in practice. Written by an experienced, international team in this cross-disciplinary field, the book is an invaluable reference for wind power engineers, technicians and manufacturers, as well as researchers examining one of the most promising and efficient sources of renewable energy. Dr. Dan Zhao was graduated from the University of Cambridge with a PhD degree in 2009. In 2010, he joined Nanyang Technological University Singapore as an assistant Professor. Currently, he is an associate Professor in the University of Canterbury, New Zealand. In addition, he is an associated editor of 3 archived sci-indexed journals, such as Aerospace Science and Technology, Low Frequency Noise, Vibration and Active Control, Progress in Aerospace Sciences. His research interests and experience include Aeroacoustics, Aerodynamics, Energy Harvesting, passive and active control, Combustion and Propulsion et al. Dr. Nuomin Han obtained her Bachelor and PhD degrees from National University of Singapore and Nanyang Technological University, Singapore in 2014 and 2017 respectively. Dr. Ernest S. C.Goh, was graduated from Nanyang Technological Universtiy with Bachelor, Master and PhD degrees in 2016. He is currently working in the University of British Columbia-Okanagan Campus. His research interests and experience include numerical simulation and wind tunnel testing of wind turbines. Dr. John Edward Cater was graduated from Monash University with a PhD in 2002. He worked in Queen Mary University London as a lecturer from 2004 to 2008, then joined the university of Auckland, as a senior lecturer. His research includes studying a variety of fluid flows and aeroacoustics. This book is well worth reading.Each chapter contains a detailed analysis and numerical and experimental case studies that consider recent research design, developments, and their application in practice. Excellent work. It's a good reference for students and researchers. This is a very good book that covers not only the key resources of aerodynamic research, but also a detailed review of its characteristics. It also contains a large number of detailed analysis and numerical and experimental case studies. In addition, the book is written by an experienced international team in the interdisciplinary field and is worthy of recommendation. A comprehensive work has been done in this book. It is perfect for the student who study in wind turbines or aerodynamics energy harvesters. Hoping this book can help you get a more comprehensive understanding.